Wednesday night is indoor soccer night. Whenever Lauren finishes a game of soccer, you can bet she doesn’t want to eat something heavy; the same is true if she eats before a game of soccer. Case in point: heavy foods do not make for a good meal before or after a lot of physical activity. Sometimes, it’s best to keep things light and fresh. I’ve already written about preparing your food without a heavy hand in previous posts–less is often more. If you want to go light, fish is an easy go-to protein; but, don’t think that fish is your only option. Many proteins have deliciously light preparations. Beef? Try carpaccio with an arugula salad. Chicken? Grill up some tenders with fresh lemon and thyme. Pork? Crusted tenderloin medallions with julienne green apple and zucchini. You get the point. 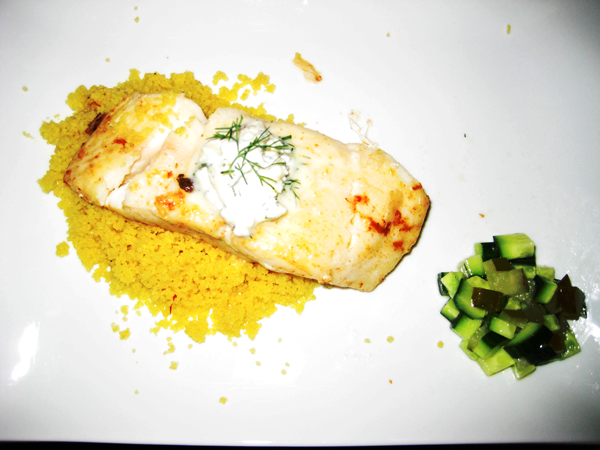 Our most recent Wednesday soccer night brought us butter poached halibut with lemon-dill creme fraiche, saffron infused couscous, and a cucumber-pickle salad. When my mother was reactivated from the naval reserves after September 11, the house felt a little empty. My two older brothers were gone (Ryan was living in Utah, and Randy was in Paraguay; my mother was sent to Pensacola, FL for training and deployment), which left two lonely guys in a house with nothing to do. My father has always done most of the cooking in the family, not because my mother can’t, because I think he just enjoys it more. This means no mushrooms and no fish, because Mom hates those two things. When she left, Dad decided we were going to start eating fish. Nothing too fancy mind you; simple breaded fish with a squeeze of lemon or tartar sauce goes a long way (of course, we’re going to take a step further with this recipe, but don’t think you have to eat it this way). Normally, Dad would make the standard American dinner entree: main dish with one or two sides. With Mom gone, and the house feeling a bit empty, he just kept things simple. We ate fish fairly often, which was fine by me, because I like fish quite a bit. This dish reminds me of those days. Things were quiet; things were simple; dinner for two. In a medium frying pan (preferably non-stick), melt the stick of better over medium heat. Salt the halibut and place skin side down in pan. Sprinkle the lemon zest over the halibut and let the fish cook for 2-3 minutes. Lower the heat to medium-low and begin spooning the hot butter over the filets. Continue this process for 4-5 minutes. Carefully flip the halibut filets over and let cook for an additional 2-3 minutes. Depending on the size of the fish, this should cook each filet so it is flaky and moist. Cooking times always vary, especially with varying stove-tops, so be sure to check fish while it is cooking. Creme fraiche is sort of like the French version of sour cream (or the French version of mascarpone). It has a firmer texture than sour cream and it’s a bit tangier. It might be hard to find in your local grocer–here in Utah, Harmon’s has it located in the deli section with the specialty cheeses and meats–but you can easily use sour cream or mascarpone for this refreshing sauce as well. Combine all the ingredients in a small bowl and mix to combine. Don’t whip the cream too much, or it will lose its texture and could potentially become clumpy. If it does, add a little lemon juice to lighten it up again. The little salad is mostly a palette cleanser, so you don’t need to make tons of it. It’s nice to have something off to the side of your main dish that you dive into every now and then just to refresh the dish and then go back for more of the main entree. You actually only need half the cucumber for this recipe, but feel free to use the whole thing if you want more. Also, you want a dill pickle that has a good crunch to it. I use Clausen’s Kosher Dills, but Vlasic dills are just as good. You don’t need to peel the cucumber. Start by cubing half the cucumber into 1/4 inch cubes. Do the same for the pickle. Combine all the ingredients in a small bowl and mix to combine. Couscous comes in various forms, but for this recipe we are simply using instant couscous found in most grocery stores (real couscous would require a lot of steaming and more time). I was first introduced to couscous when I was living in Trapani, a small city in western Sicily. African culture influences Sicilian culture quite a bit, which is why Sicilian cuisine often infuses more spices and bolder flavors. However, when it comes to couscous, the Sicilians like it pretty plain. Usually, Sicilians serve couscous with fried fish. They fry the fish whole, fluff their couscous, and then pour some fish broth over the couscous, for a little added flavor. It’s a meal all by itself, and it’s delicious. I wanted to marry memories of my father’s fish with memories of Sicilian couscous, so I decided that a little saffron would boost the flavor without over-complicating the dish. A quick word about saffron: it’s expensive and bold. You don’t need to use saffron in this dish, but it adds a sweet and earthy flavor to the couscous. Use it sparingly, as it is expensive, but can easily take over a dish if used too abundantly. The directions on the couscous package usually explain fairly easily how to prepare couscous–we’re just adding an additional step with the saffron and replacing the water with stock. Melt the butter in a small pot and combine with stock. Add salt and saffron. Bring liquid to a small boil and add couscous. Stir to combine and remove from heat. Immediately cover and let sit for 5 minutes. Uncover and fluff the couscous with a fork. It should be light and fluffy. Plating is simple for this dish. Add a spoonful of couscous on one side of the plate and drizzle some of the butter that the fish was cooked in over the couscous. 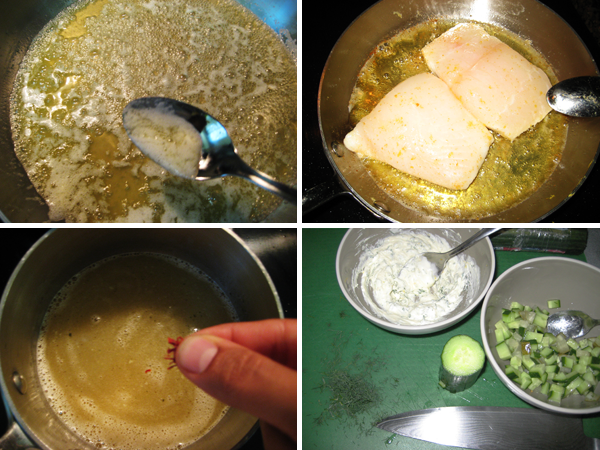 Place one halibut filet over the couscous and add a dallop of creme fraiche to top. On the opposite side of the plate, add a 1/4 cup of cucumber-pickle salad. Fresh. Simple. Tasty. Eat it after a physically exhausting day. Eat it if you’re making dinner for two. Eat it because it’s good. Enjoy. I love fish too, especially with dill! I must admit I thought it funny that you used a whole stick of butter and creme for only 2 fish fillets and then called it “light”.